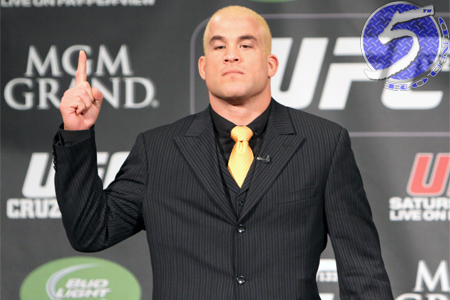 Did anyone miss seeing Tito Ortiz (pictured) give Stephan Bonnar the double-bird after posting a split decision victory over his archenemy on Saturday night at Bellator 131? The California State Athletic Commission certainly saw it. It’s not as though the penalty will hurt Ortiz much in the pocket book. “The Huntington Beach Bad Boy” made a reported $300,000 for merely stepping into the cage this weekend inside Valley View Casino Center in San Diego. Ortiz controlled the slow-paced action from beginning to end. Although, while two judges awarded him with 30-27 scores, one judge inexplicably gave the fight to Bonnar with a 29-28 verdict.